It appears that how you use water is more important than how much you use when trying to protect vines from the impact of heatwaves. Two projects being run in the Riverland by the University of Adelaide are producing quite dramatic results when applying specific cooling techniques rather than just leaving the everyday irrigation running for longer. Delivering water directly to the roots and surrounding soil the night before a summer scorcher can reduce daytime canopy temperatures by as much as 5°C below ambient temperatures. Using misters to lightly spray the canopy during the heat of the day is even more effective, dropping the temperature by 10–12°C. 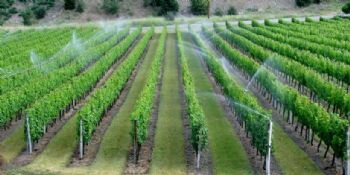 The techniques are quite different, but each achieves the aim of ensuring vines do not shut down even when temperatures hit the mid 40s – which is contrary to previous thinking. And, according to project leader Dr Vinay Pagay, even if you have to use them these techniques 5 or 6 times a year it will only increase your water usage by 5 per cent.